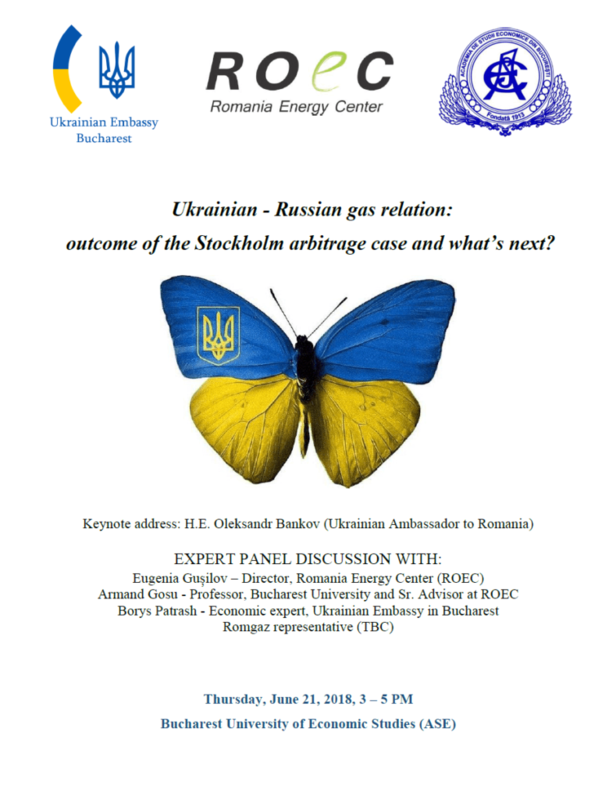 Romania Energy Center (ROEC) together with the Ukrainian Embassy in Bucharest and the Bucharest University of Economic Studies are organizing a special event dedicated to the Ukrainian – Russian gas relation: outcome of the Stockholm arbitrage case and what’s next? The expert panel discussion will focus on the results of the Stockholm arbitration case between Naftogaz and Gazprom – one of the biggest commercial arbitration in history by total value of claims and counterclaims, and discuss the latest regional developments in natural gas, especially how the commercial resolution of relations between Gazprom and Naftogaz is likely to influence and re-design the future regional gas flows. What is the future of the transit contract (ending in 2019) in this light? What does it mean for Ukraine’s natural gas market reform? What does it means for regional gas transit? What is the current state of affairs regrading cross-border flows between Romania and Ukraine? What signal does the Stockholm ruling send to the market participants? The aim of the event is to raise awareness in Romania about latest regional developments in natural gas topics by organizing an expert panel discussion on a current economic topic the details of which are less known to the Romanian public. The event aims to generate a constructive discussion about the dynamic on the gas market in our region, on how the commercial resolution of relations between Gazprom and Naftogaz are likely to affect and re-design the future regional gas flows, as well as what role will Romania play in the future regional landscape. PARTICIPATION: by invitation, but open to the interested public (RSVP is mandatory).